Let us assume that you are reading an interesting article on your phone, but want to view it on the bigger screen of your iPad. This can be easily and effortlessly achieved by using the AirDrop feature in iOS. 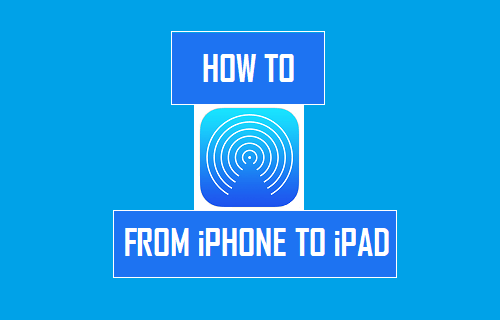 You will find below the actual steps to AirDrop from iPhone to iPad. 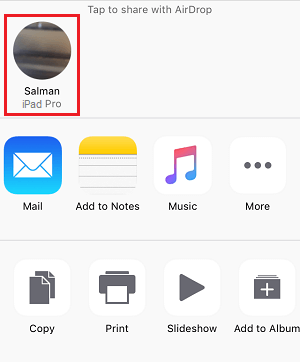 In case you haven’t tried it yet, the AirDrop feature on your iPhone allows you to transfer any type of content (Photos, Videos, Files, Articles) from iPhone to iPad, another iPhone or to your Mac, without using any wires. In order to use AirDrop, you will have to first setup AirDrop on your iPhone by following the steps below. 1. Open the Control Center on your iPhone by swiping up from the bottom of your screen. 2. In Control Center, tap on the WiFi and Bluetooth icons in order to enable WiFi and Bluetooth on your iPhone (See image below). 3. Similarly, make sure that WiFi and Bluetooth are enabled on your iPad. 4. Next, Swipe up from the bottom of the screen on your iPad and then Force touch or Tap and Hold on the Networks widget in order to expand the Networks widget. 6. On the next screen, tap on the Everyone option. Doing this will allow your iPad to receive data from your iPhone. 7. Similarly, repeat steps 4, 5 and 6 on your iPhone to make sure that it can receive data from your iPad. 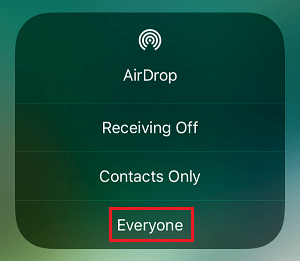 Once AirDrop has been properly setup on your iPhone and iPad, you can follow the steps below to AirDrop from iPhone to iPad. 1. Open the App which contains the Data that you want to AirDrop from iPhone to iPad. For example, open the Photos App on your iPhone, in case you are trying to AirDrop Photos from iPhone to iPad. 2. In the Photos App, select the photos that you want to AirDrop and then tap on the Share icon located at the bottom left corner of your screen (See image below). 3. On the next screen, tap on the Device Name and the Person that you want to Share Selected Photos with (See image below). 4. Now if you are using different Apple ID’s then you will be asked on your iPad whether or not you want to Accept the files. Tap on Accept in order to complete the file transfer.